This time I was assigned The Camp ASCCA Journal at athttp://www.mail2web.com/cgi-bin/redir.asp?lid=0&newsite=http://www.campascca.org/journal/. I'm very impressed with the work being done by Camp ASCCA. Their Mission is to help children and adults with disabilities achieve equality, dignity, and maximum independence through a safe and quality program of camping, recreation, and education in a year-round barrier-free environment. They have developed a very innovative use of blogs to tell their story. This is an important example for organizations who may want a web strategy, but may not be able to build a traditional web site. This site looks pretty sophisticated, but many of the pages are interactive blog pages that enable members of Camp ASCCA to post up-to-date information about the work they do, and about work other environmental organizations are doing. I encourage you to visit the site. In addition I was invited to write about the blog at http://www.christine.net . I visited this blog and was pleased to learn that the writer is part of the http://www.omidyar.net/ organization. I'm one of more than 10,000 people who have become a member of O-Net. I don't see the same focus on non-profit issues on this blog as I have in others listed on the non profit blog exchange, but the site provides links to other technology related blogs for anyone interested in learning more about various communications technologies. I participate in the blog exchange as part of an on-going effort to build a "network of purpose". What is this? Read the ppt essay titled Creating a Learning & Collaboration Network of Purpose which is located in the Tutor/Mentor Institute section of http://www.tutormentorexchange.net. Or join me next week (May 2-5) at http://www.socialedge.org/ where I'll lead a discussion about building networks of purpose. This is the first of several on-line forums that the Tutor/Mentor Connection has organized for May and June networking of non profit tutor/mentor leaders and their supporters. The blog exchange is building a network of groups focused on sharing information about non profits. One hundred blogs are now listed at http://nonprofitblogexchange.blogspot.com/ I've visited many and have posted links to some of the best in the LINKS section of http://www.tutormentorconnection.org. As non profit leaders and supporters link to each other and build relationships, some will begin to work together to help non profits get the resources each needs, but which the all compete with each other to get. The way non profits are now supported is a dysfunctional system. It does not work effectively. The competition of hundreds of non profits for scarce resources is a huge waste of manpower and dollars. Imagine if we could reverse the process and by working together, motivate donors to go to our web sites to see what we do and decide if they want to help us. Is this possible? Let's talk about it. This is a guest message, written by Dan Truesdell, a volunteer with the Cabrini Connections Tutor/Mentor Program in Chicago. This is a letter Dan submitted to the Chicago Tribune. In response to the Chicago Tribune’s recent stories on the shortage of textbooks in Illinois public schools, I am writing to provide witness to this problem here in Chicago. I am a volunteer tutor at Cabrini Connections, a non-profit tutor/mentor program created to help middle and high school students in the Cabrini-Green neighborhood succeed in school and prepare for adult life (http://www.cabriniconnections.net). Our program recruits volunteers from Chicago area businesses to be tutors/mentors. We meet with teens from 6 to 7:45pm each week, in hours when schools are usually closed. I've been involved for 2 years and some of our teens have been involved for 4 and 5 years. Quite frequently (and sadly), I see many students who come to the program with tattered and outdated textbooks - - if textbooks are available at all. In the case where textbooks are not available to them, students come with loose worksheet material for homework, which lack the valuable reference information available in a textbook. This program maintains a small library to provide students with reference information in order to teach the concepts that are missing from the loose material they receive in school. It also has computer lab, which enables students to search the Internet to find the most current learning information, with the help of volunteers. In most of the discussion of public school performance, there is little mention of what volunteers and business can do to support non-school tutoring/mentoring. Yet, there are organizations like ours in many parts of Chicago, helping to provide public school students with the tools needed to succeed. I think I've learned as much from the experience as have the students I've worked with. One of the things I've learned is how poorly supported students are in Chicago's public school system. Textbooks are a key resource in learning, as are places like Cabrini Connections, where youth can connect with a network of volunteer tutors/mentors. While the wheels of politics may grind slowly to fix this problem in the public realm, private citizens can help by providing their time, talent or financial contributions to the many Chicago tutoring and mentoring programs that are addressing this problem now. Biotechnology Conference Draws attention to new careers. Will inner city kids be part of this industry? Last week Chicago hosted a Biotechnology conference where leading scientists from around the world gathered to network and share ideas. At the same time Time magazine and Bill Gates and the Oprah show were focusing public attention on the high school drop out crisis in America. What's the connection? If America wants to have a lead in the biotechnology industry, more kids need to choose this as a career. If we want to keep more kids in school we need to connect them with mentors who can build aspirations and provide support. We need to create a pipeline to careers and one end of the plumbing needs to be reaching elementary school kids in inner city neighborhoods all over America. This is a simple concept, but a complicated idea. Thus, I cannot explain it all in this blog. However, we can provide a forum for people to gather and learn, if we can use the internet effectively to support social networking, and networking for a purpose. Today (April 19) and tomorrow, Tech Soup (http://www.techsoup.org) is hosting an on-line discussion of social networking concepts and applications. During May and June, the Tutor/Mentor Connection will host a variety of on-line and face to face forums intended to build a network of business, philanthropy, colleges, non profits and educators who work together to build a pipeline to all careers, including biotechnology. You can read about these at http://www.tutormentorconference.bigstep.com. I encourage you to participate and to encourage others to join in. 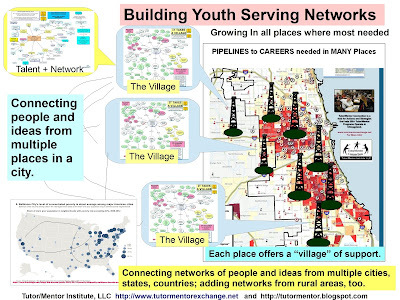 As we learn to learn and network on-line, and build social networks of purpose, we can innovate ways to create pipelines to careers, and this will be a big step toward reducing the drop out crisis in America. Appology. Correct spelling is "Oprah"
In an email Tutor/Mentor News that I sent to my entire network yesterday, I misspelled Oprah's name. Several people emailed to correct me. Thank you. I hope you don't kill the messenger, but instead, focus on the message. We need attention on this issue every day for many years and in many ways, not just for a few days of this week. Demand for Better High Schools Grows Nationally. On Tuesday, April 11 and Wednesday, April 12, the Oprah Winfrey Show will turn the focus of its estimated 49 million U.S. viewers to the dropout crisis in America's high schools. Also this week, TIME magazine's April 17, 2006 cover story, "Dropout Nation," provides an in-depth look at the nationwide dropout crisis and the repercussions that accompany it. Visit the Connect for Kids web site at http://www.connectforkids.org/node/2776 and read the statistics on this drop out crisis. Will this public visibility be a random act of media attention? Or can it be sustained as daily bread to feed the understanding of the thousand of people who need to be involved if there is to be a change in the support system for youth who don't make it through school and into careers on the first chance they have. As we approach Easter weekend, think of the 2000 years of leadership that have resulted in millions of people coming together this weekend. Who will provide the long-term leadership that brings millions of people into a church of commitment to underserved youth in America and other countries? 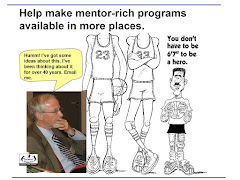 Visit the Tutor/Mentor Institute section at http://www.tutormentorexchange.net and read power point essays that illustrate the role business, professional, faith and media leaders can take to support a pipeline of organizations that mentor kids through school and into careers. Look at the Maps on the site to see the large number of neighborhoods in big cities like Chicago where an orchestra of programs are needed, but where too few programs currently exist. Then, visit http://www.tutormentorconference.org and make an effort to connect with others in the May and June Tutor/Mentor Conferences so you can become part of a solution to this problem, with your time, your talent, your treasure and your leadership. Read about the www.cabriniconnections.net program and its efforts to help inner city teens to careers.